This post is part of the YummyMummyClub.ca and Goody #GoodyTips sponsored program. I received compensation as a thank you for my participation. This post reflects my personal opinion about the information provided by the sponsors. Going from a day of fun with the kids to a night out on the town can feel like a big production. But thankfully, Goody has come up with great accessories to keep my hair in place without sacrificing the styles we all love. Featuring a wave of silicone that holds your hair in place, their SlideProof accessories will confidently make sure that your hair will stay put. 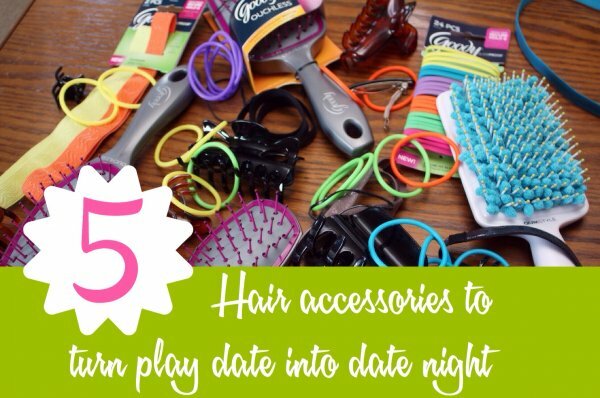 Here are five Goody accessories you need to quickly transition your play date hair into date night. The daily life of a parent is busy, and if you’re like me, you need to plan out your whole day right down to the shower you are going to have from 3:25 to 3:35 in the afternoon. For those busy days when a shower is a must before heading out in the evening but time is not on your side, try my new favourite brush. The Goody QuikStyle Paddle Brush has blue anti-microbial microfibers in between the bristles that removes excess water quickly and cuts down drying time. The Goody QuikStyle and Ouchless brushes make styling a snap. For quick fixes on the go, the Goody Ouchless Brush comes in a small size that is perfect for tossing in your purse. These brushes work great and cause 55% less breakage then regular brushes because of their FlexGlide bristles which are strong enough to get through your tangles, but gentle enough that it won’t damage your hair or cause a lot of discomfort. I have a daughter who has some sensory issues with pain and this is her favourite hair brush. As a parent, my hair barely makes it through some days without falling out of style as I run errands or play Red Rover for the hundredth time. Thanks to these new SlideProof elastics by Goody, I can put my hair up in a quick ponytail or try out a fun side ponytail for a night out with friends. The silicone lining keeps my hair in place so that means less time fussing in front of the mirror. Add a pop of colour to your hair style with these fun SlideProof head wraps from Goody. Available in a thick and thin size, and a wide range of colours, these head wraps have a layer of silicone that keeps your hair in place. You can wear them on their own or jazz up a simple ponytail look. During the day, these are great for keeping your hair back during play time with the kids. This is one of my favourite hair accessories. I love claw clips, but in the past they always lost their grip and my hair fell out of place. The new Goody SlideProof claw clips have a silicone grip inside and my hair stays where I style it. 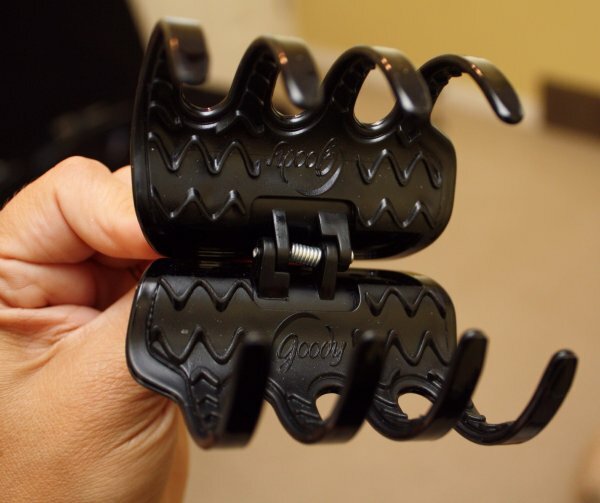 The Goody SlideProof claw clip has a silicone pad that grips hair and holds it in place. This clip is great for a day at the spray park or a night out with girlfriends. No matter what, it stays in your hair. I have thick hair and thanks to the silicone lining, I can use the smallest of the clips and they stay firmly in place. Here’s a quick style that takes me from a play date with friends to date night out with my husband. This is one of my favourite looks because it is fun and doesn’t look too serious. Instead of opting for the single ponytail, I go for a double ponytail during the day. It will keep everything out of your face and look just a little different than the usual. 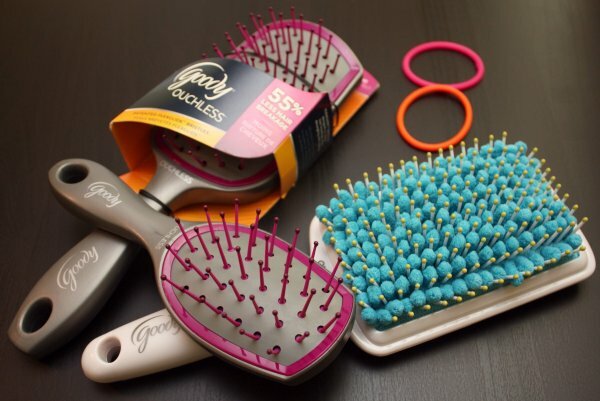 Use the Goody Ouchless brushes to separate your hair into two sections. 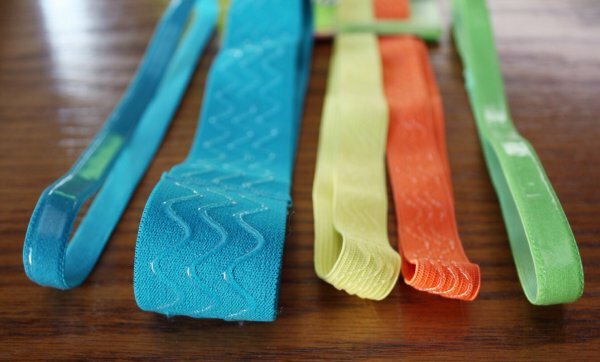 Using the Goody SlideProof elastics (which come in many different colours and styles), simply pull your hair to the back, split in half lengthwise down the back of your head, and put your elastic in. 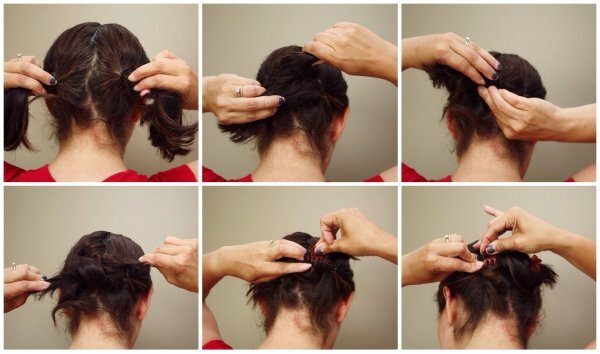 Repeat on the other side for your second ponytail. Tip: In the morning when putting your elastics in, pay attention to where you want your twist to be in the evening. If you want a low twist, place the elastics closer to the base of your head. Take each end in your hand and tie them together in a half knot (once through, thus twisting the hair). Using your small Goody SlideProof claw clips, clip your hair in place on top of each elastic in the photos shown below. Secure and style your tips with hairspray. Goody products are available at London Drugs, Loblaws and Jean Coutu. Check out Goody on their social media sites for more hair inspiration; Goody on Facebook, Goody on Instagram, Goody on Pinterest. Do you have any quick fix styles to share? Please share them in the comments. I’m always looking for new styles to try. We all love warm weather but no one loves the inevitable and dreaded frizz it brings to our hair. Read YMC’s Frenzied Fashionista’s post to learn about the only Goody accessory you’ll need this summer to pull off simple, stylish, frizz-free looks for all occasions. Previous: Dear parent, Hold on a little longer.